Soap making is just fun. 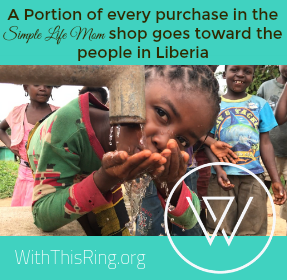 It’s even more fun when you can share it with others! 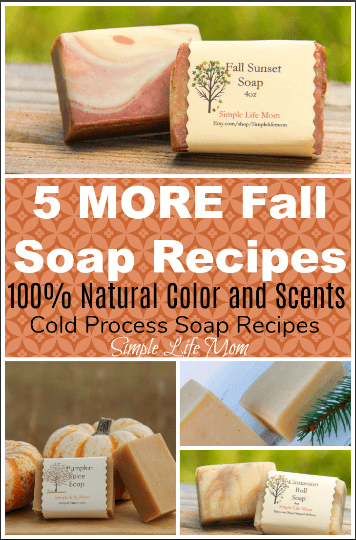 Last year I shared 5 Fall Soap Recipes with you and they are still a hit. 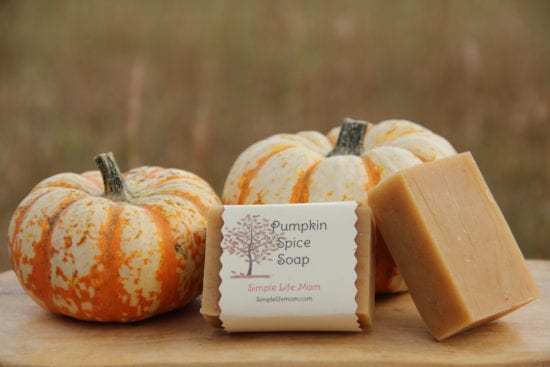 Since it’s that time of year again, I thought it would be fun to share 5 MORE Fall soap recipes with you. This time I want to share more on how you can color your soaps for beautiful (and natural, of course) Fall colors. Muted sunset colors are super easy to make naturally within soap. This makes the reds, oranges, and yellows of Fall soap recipes easy to achieve simply by adding the colors at trace. 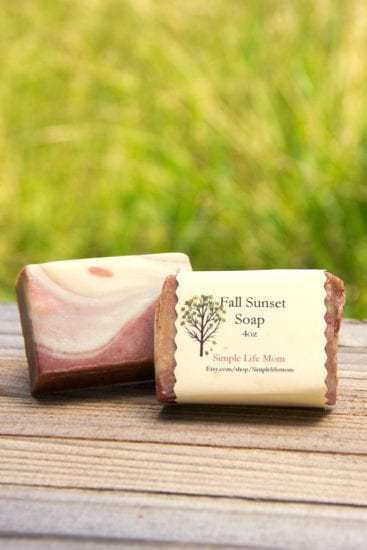 You can get different shades or even brighter colors by adding color at different times (to oils or lye water), but for simplicity these 5 Fall Soap Recipes will just suggest to add the colors at trace. Feel free to experiment with other methods suggested below. Color can be added to the lye water, to the oils, or at trace. For the longest time, all I did was add colors at trace. These are a simple stir in (remove a scoop and stir in color to ensure there are no lumps, or not. Sometimes it speckles, which can be pretty, sometimes it doesn’t). alkanet root powder for purple. But you can get richer and brighter colors sometimes by adding them to the lye water or infusing them into your oils before you begin. Adding Color to Lye Water? or add calendula flowers to lye water for a richer yellow. Oils make probably make the brightest colors. It’s easy to infuse oils. Simply gently heat the oil with the herb, seeds, or powder in it and then allow to cool. Use in your recipe. For example, if your recipe calls for olive oil, infuse olive oil. and pretty green when infusing parsley powder. 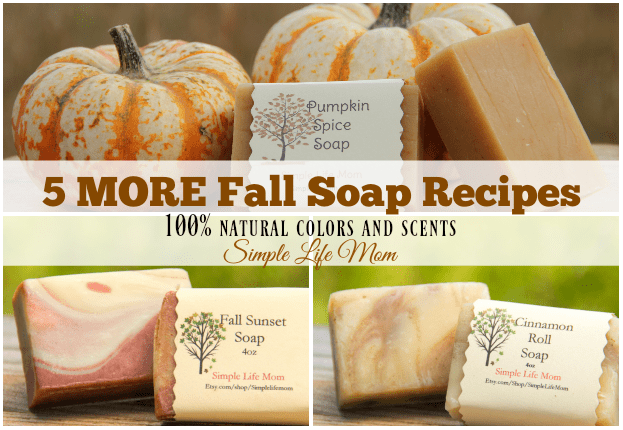 Remember that you can find 5 Fall Soap Recipes HERE as well. So check out both articles of recipes and then choose your favorites to try. 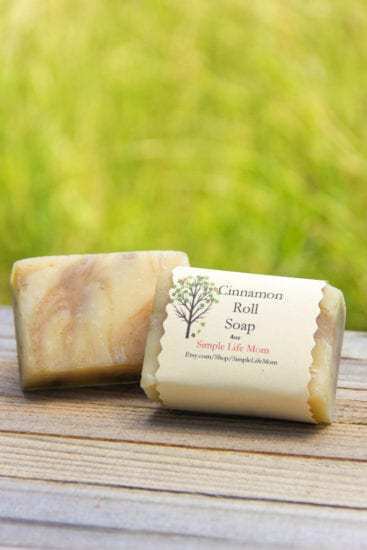 If you are new to making soap and you need extra instructions, you can learn everything you need to know to get you going in 7 Easy Steps to Homemade Lye Soap for Beginners and What is Trace? Make it or find it in my SHOP. Pour main batch into lined mold. Pour cinnamon soap over batch in a back and forth motion. Combine oils in a large pot and heat to 110 degrees Fahrenheit. Separate soap batter into 4 equal bowls. Leave one bowl alone, add Morrocan clay to the second, rose clay to the third, and turmeric powder to the fourth. Stir until combined. Pour colors into 2 opposite corners of your soap mold, pouring for a few seconds until switching colors. Rotate between colors to make a swirl design. If desired, gently turn your mold to gently mix the layers slightly. Combine tallow and oils in a large pot and heat to 110 degrees Fahrenheit. Remove 1/2 cup of soap and mix in paprika and turmeric and essential oils. Blend until combined. Pour soap into lined mold. Make tea with the chai tea bag. Save the water and the tea bag. Weigh 12.2 ounces of the tea water. Combine tallow, butter, and oils in a large pot and heat to 110 degrees Fahrenheit. Wearing appropriate safety equipment, go outside and add lye to the tea water and stir until dissolved. Let cool until it is around 110 degrees Fahrenheit. Add tea leaves and essential oils. Blend until combined. Make the recipe (find it below) or get it from my SHOP. 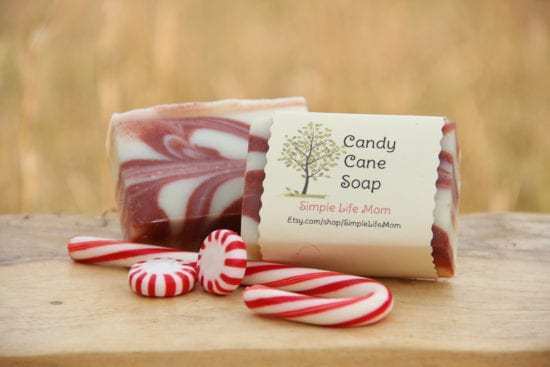 Want more Holiday Soap Recipes? Thank you so much for sharing your recipes!!! 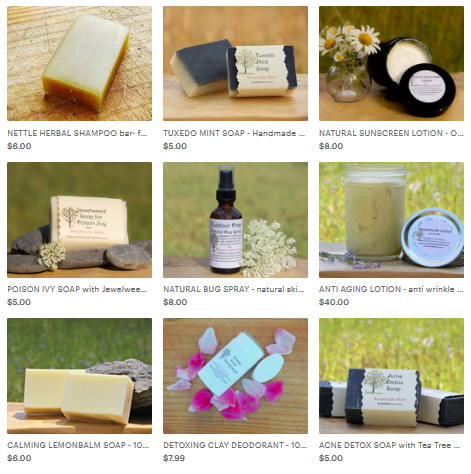 I haven’t yet gotten the courage to try soapmaking yet, but have several books on it, including yours! I’d like to try this winter….. I can’t tell you how much I appreciate your sharing. I’m new at soap making, and it really helps me to get the feel for it without the stress of making my own recipes. I am no where near qualified for that yet, but I’ll get there in time. I’m learning so much from you. Thank you! I love your website, by the way. Merci de ce beau partage… hâte de préparer mes savons d’automne! Awesome. Thanks for the share. Grateful for the natural recipes. Did not want lots of enbeds. This recipe was my first foray into soap making. I made this with a group of friends The directions were clear and worked perfectly. I made the chia tea soap last night. The smell and color is really great. The recipe fit the 3 lb mold perfectly. I am so excited to try after the soap cures! We had such a good time hanging our in making soap and bath bombs.